This PWCW article by writer A. David Lewis perfectly encapsulates a weird, pervasive and lingering element of modern comics culture: complaining about tons of supposedly lousy autobiographical comics out there, while not providing examples of any. It's a rhetorical stunt that if I had to guess probably sticks around because 1) it's funny, 2) it's easy, and 3) it plays well with both the self-lacerating qualities of many alternative and arts comics readers and the defensiveness that many genre fans exude like flop sweat in an old-timey newspaper strip when it comes to having their tastes challenged. 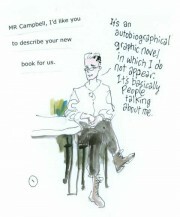 I would like to make the argument that it, not autobiographical comics, should go away. Making fun of autobiographical comics has become a facile position for critics and wannabe critics to take. You can make this general argument in snotty comments to the troops like "If I have to read another mopey comic about some guy who wants to talk to a girl, I'll die," or you can make it into a funny comic like Johnny Ryan has, or you can fill your essay with truisms about the difficulties of modern autobiography and making comics like Lewis does at PWCW. There's one big problem, and that's not even getting into Lewis' prickly and unsupported reading of great autobiography in prose or his bizarre definition of memoir or even his offering Walter Conkrite as an exemplar of journalistic excellence. The primary fact remains that when it comes to naming all these supposedly awful autobiographical comics out there, no one, including Lewis, ever seems up to the challenge. In fact, if you hunt in Lewis' article, the only artists mentioned are brought in for praise, not scorn. Art Spiegelman, Alison Bechdel, Craig Thompson, Harvey Pekar, Marjane Satrapi, Tom Beland, Joe Matt, Phoebe Gloeckner (she's done decades of comics, btw, not just her recent hybrid work as the article suggests), Jennie Breeden, Joe Sacco, Alex Robinson and Grant Morrison are all complimented. Robert Crumb's mention is neutral. Not a single person or work is brought up in a negative fashion. Okay, fine, maybe politeness keeps Lewis from actually naming names, although in that case I'd argue refusing to be specific certainly weakens his argument and the seriousness with which we should take his points. But there's a bigger problem. Look at those names. That's a dozen names, even if you don't add anyone else, like Julie Doucet or Chester Brown or Eddie Freakin' Campbell. Take out Robinson and Morrison because they're described in the article as using autobiography rather than doing it. Limit each cartoonist to a single book or creative effort, which is of course absurd. That's still 10 works. For there to be such a deluge of crappy autobio that it needs to be singled out repeatedly, by so many people, there should easily be 10 times the number of lousy autobio comics, right? That's to make the normal ratio established by Sturgeon's Law! Really, if autobiographical comics are such a scourge that we need to hear about it so often, it should be easy to rattle off two or three hundred lousy autobiographical comics and their creators. A hundred of them should have equal market penetration, surface skill and impact as the comics Lewis mentions for his argument to work, otherwise you're doing the equivalent of criticizing Broadway for the efforts of your local high school's drama club, but I'd take a straight up list of 300 bad autobiographical cartoonists. Would anyone care to make and defend such a list? There was a brief time around 1992 or so when it seemed like a lot of cartoonists were doing autobiography. I don't think there were actual high numbers of cartoonists doing autobio when compared to the hundreds of cartoonists in the field, but it probably seemed that way. Such works provided a sharp contrast with both the still-dominant fantasy superhero genre at its highest point of unsophisticated stupidity since World War II due to Image and the previous generation's dominant response to such comics through long-form fantasy comics of one type or another which were now mature enough we began to have a grasp on their quality and impact. Also, a lot of that early '90s autobiographical work was potent, a few even groundbreaking, and so probably made the category seem more dominant than it was. Unfortunately, the too-easy criticism of a long-ago period's minor excesses has stuck around like a rotting animal in comics' drywall, stinking up the place. It's time we let it go. All comics genres are difficult. All comics genres have a minority of great works. There are easily more arguably good autobiographical comics of stature than stridently awful ones. Like many PWCW articles, this seems like an assignment designed for a byline more than it does an urgent argument about the art form intended to educate and enlighten; most editors require examples, after all. The reason why it deserves to be kicked in the face over and over again instead of dismissed like so many others is because it deigns to be prescriptive, to tell cartoonists what comics to pursue and what kind to avoid. Forget the critical argument if you must, which Lewis loses without scoring a point, and the historical argument for which he fails to show. Artists should make whatever comics they feel compelled to make, and they shouldn't be cowed by half-assed, poorly argued essays that fail to bring the goods.